Ann Brophy kindly donated three very interesting photos to share with the local community and all our friends abroad. 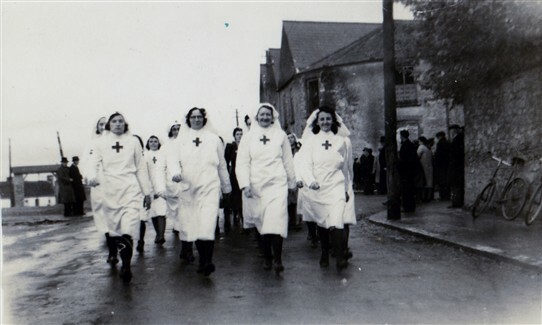 Anne suggests that the marching ladies in this first photo are in the uniform of The Red Cross. They are marching from Cornmarket, past the town hall towards Bowgate St.
Notice the old crane and cottages at left background and the private house adjoining the old town hall on right side. 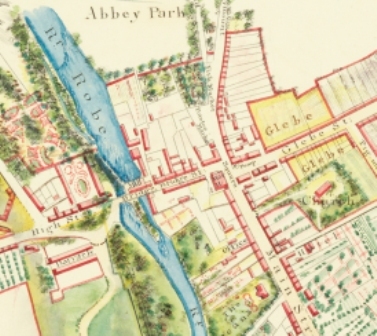 Also on the right there is a high wall where now a house, shops and a petrol station operates. Anne found the three photos among her aunt's papers. They were probably taken in the late 1940s when Ireland was going through the Emergency** while the rest of the world was involved with World War 2. Anne wonders is there anybody that can supply further information or names for any of these ladies? 3. Maybe a Ms. Maye? **Ireland remained neutral during World War II, but declared an official state of emergency in September 1939, followed the next day by the Emergency Powers Act which gave sweeping new powers to the government for the duration of the Emergency, such as internment, censorship of the press and correspondence, and control of the economy. We at Historical Ballinrobe appreciate your donation; Thank you Anne. This page was added by Averil Staunton on 14/12/2013. No.3 is Bride Moran sister of Mrs. Tess May who had a restaurant on Main St. Bride later married Jim McCormack and lived on Neale Rd.